Resin-X cleaning powder removes fusible interlining residue from Teflon coated surfaces efficiently, reliably, and safely at fusing operating temperatures. Fusing experts around the world choose the economical, environmentally safe and easy-to-use Resin-X cleaning and conditioning powder. Resin-X is safe to use at fusing operating temperatures-no need to wait while the machine cools down. Apply Resin-X cleaning powder to the Teflon surfaces and watch it melt instantly. 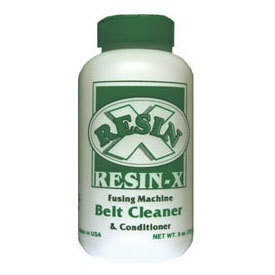 Resin-X loosens residue and wipes off easily. We are a global, diverse company, passionately committed to providing outstanding products and service. Our knowledgeable Staff has been doing business online since 1998. Our commitment to our customers is unsurpassed. Every product we sell is tested to meet our high quality standards.